Posted May 17, 2018 by laurielmorrison & filed under Every Shiny Thing, Middle Grade at Heart. Today is Every Shiny Thing‘s one-month birthday! It’s been an exciting month, and Cordelia and I are so happy to have our book-baby out in the world and so grateful for the support it’s received! I thought I’d share a quick post this morning with some updates and a quick request. We’ve done a lot of events, which have been a blast. 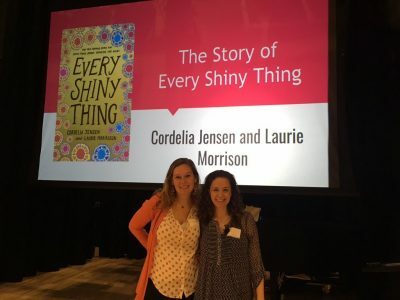 We’ve done assembly presentations at schools about the story of Every Shiny Thing, from a glimmer of an idea in June of 2015 to an actual book in April of 2018; we used examples from the book to teach a writing workshop about voice to seventh graders; and we did a presentation for adults about the changing landscape of the coming of age novel and how our books fit into that landscape. We’ve also had lots of fun bookstore events with signings. We have a few more events coming up in June in Philadelphia, New York, and New Jersey, and you can check my events page for details about those. We’ve also done some more guest posts. Here’s one that meant a lot to both of us: an essay on the Nerdy Book Club site called “What It Means to Hope,” about how our work with kids inspired our characters. I also wrote this special “Writer’s Toolbox” guest post on MG Book Village called “Writing a Fallible Narrator.” It’s about strategies I used to make Lauren come across as mistaken but still sympathetic. Every Shiny Thing is also the featured May book for the MG@Heart Book Club! That means that in addition to some posts about the book on MG Book Village, there will be a newsletter featuring great content about the book, mostly geared toward educators, that will go out on May 28. If you’d like to subscribe to the newsletter, you can do that here. Plus, there will be a Twitter chat about the book that anyone is welcome to join on Tuesday, June 5th at 8PM EST with the hashtag #mgbookclub, and Cordelia and I will be guests on the Books Between podcast and will unveil a special interactive video page about the book. I’ll be sure to share these highlights here when they’re ready. Thank you to all of you who have supported my debut journey and read Every Shiny Thing. If you’ve read the book and have a minute, I’d really appreciate any reviews, especially on Amazon, because those reviews help ensure that other readers who might like the book will find it…which, in turn, helps ensure that I’ll get to keep writing books! Also, if you’ve gotten a copy of the book and are too far away to have it signed in person, please let me know if you’d like me to send you a signed and personalized bookplate to put inside! Yay, Laurie and Cordelia! I know you’re both so busy. But I still want to have you on my blog to give away a copy of your book. Definitely, and thanks! We’ve gotten through the big push of events and would love to set something up with you!